Diet & Nutrition Need a drink? The subject of this article (first published in Natural Health magazine) is a very important aspect of my book The In-Sync Diet written with nutritionist Fleur Borelli. Who would have known that drinking water incorrectly or not having enough of it can actually make you fat? But as Fleur explains it (based on very recent and new information) when we are dehydrated our bodies prepare for an emergency and start to store fat. For years I used to walk around with my water bottle taking little sips through the day. Fleur pointed out that these little sips do not hydrate the cells fully even though it may seem like you’re drinking a lot of water through the day. So how are we supposed to hydrate? Read on. When we were children in the days before computers, we would run around and play and then drink water when we were thirsty. It was natural and we didn’t think about it. But somewhere along the way, we got scared of being thirsty and thought if we didn’t continually sip water throughout the day, we would become dehydrated which was like some terrible disease. 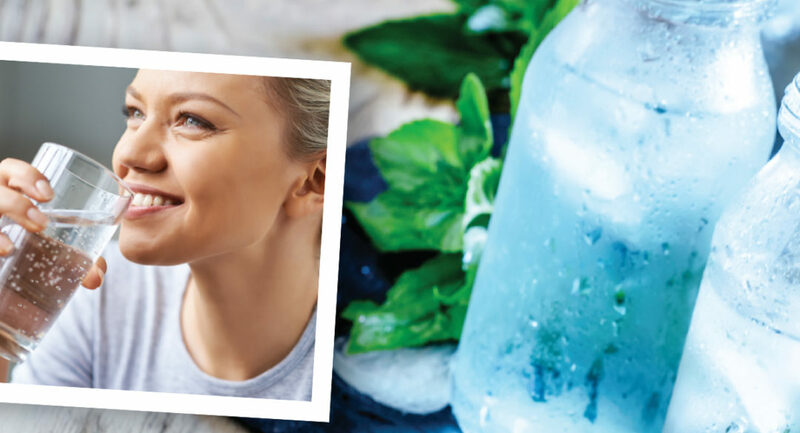 While it’s true that being dehydrated is not great, that’s not because it’s a disease, but because some research shows when dehydrated the body goes into survival mode and begins to store fat. But here’s the really interesting thing – sipping little bits of water may not fully hydrate you properly. That’s because we are not drinking enough at one time to fully satisfy our cells. Nutritionist Fleur Borrelli, my co-author on The In Sync Diet book, looks at our diet from an evolutionary point of view and she believes that our natural instincts as children were spot on. In other words, we should only drink when thirsty and then drink a good amount. The brain is very sensitive to changes in the water level in the body because it needs to regulate the thickness of the blood or osmolality. When the blood is too thick we become thirsty. 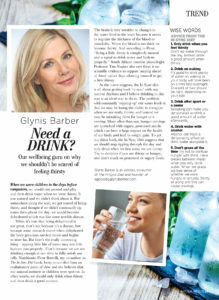 And according to Fleur: “Being a little thirsty is completely natural and a signal to drink water and hydrate properly.” South African exercise physiologist Professor Tim Noakes also says there is no scientific evidence to support ‘staying ahead of thirst’ rather than allowing yourself to get a little thirsty. As the name suggests, The In Sync Diet is all about getting back ‘in sync’ with our natural rhythms and I believe drinking in this way is an ideal way to do so. The problem with constantly ‘topping-up’ our water levels is that we may be losing the ability to recognise when we are really thirsty, and instead we may be mistaking thirst for hunger or a craving. More often than not, hunger cravings are quenched with sugary, processed snacks which can have a large impact on the health of our body and lead to weight gain. To get our thirst back, The In Sync Diet suggests that we should stop sipping through the day and only drink when we first sense we are thirsty. Try to decipher if you are thirsty or hungry, and don’t snack on processed or sugary foods. Only drink when you feel thirsty rather than sipping water through the day. Instead drink a good amount when thirsty. It’s good to drink plenty of water on waking as your body will have been on a mini fast overnight. One pint or two should be about right, depending on your size. Sweating can make you dehydrated so drink a good amount of water after sport or being in a sauna. Drink water with alcohol. Alcohol can have a dehydrating effect so drink water alongside it. Don’t graze all the time. Try not to confuse hunger with thirst. Have breaks between meals when you only drink water. When we graze, we lose sense of whether we were hungry or actually thirsty all along and this can cause cravings.